Velvet Paw Creations: "Purple at Christmas" Non-Traditional Christmas project for Delicious Doodles DT! "Purple at Christmas" Non-Traditional Christmas project for Delicious Doodles DT! It's time for our new Challenge over at Delicious Doodles Challenges and this month we challenge you to create Christmas projects either using a non-traditional image or non-traditional colours or you can do both! 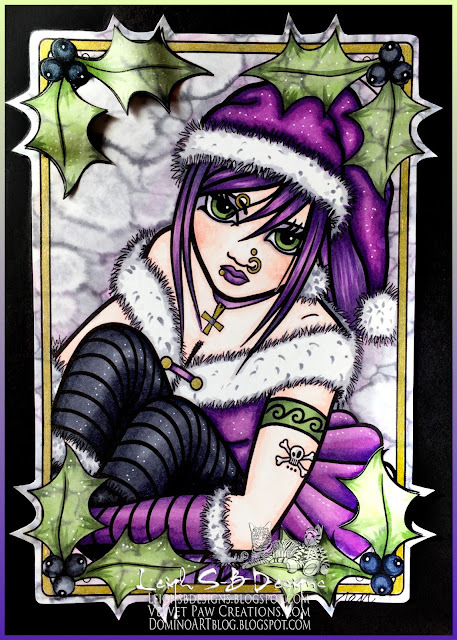 Here's my alternative gothic project for your inspiration featuring Delicious Doodles digi stamps, An Emo Christmas and Holly Border. I merged the two digi stamps together in Photoshop CS6 and printed out the whole image and then just two of the holly corners, top left and bottom right. I coloured everything with Copic markers and added white highlights with a white Dylusions paint pen, gold details with a metallic gold gel pen and touches of sparkle with a clear Wink of Stella pen. I fussy cut out the main image and mounted it onto a black folded card I made from a sheet of card stock. I also fussy cut out the two holly pieces and manipulated the leaves to create the 3D embellishments for just the two corners. Love the purple and image! Love it! Purple is a favorite color of mine.